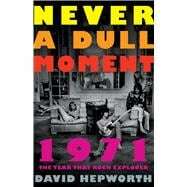 1971 started the following day and with it the rock era. The new releases of that hectic year—Don McLean’s “American Pie,” Sly Stone’s “Family Affair,” Marvin Gaye’s “What’s Going On,” Joni Mitchell’s “Blue,” Led Zeppelin’s “Stairway To Heaven,” the Who’s “Baba O’Riley,” and many others—are the standards of today. DAVID HEPWORTH is a music journalist and publishing industry analyst who has launched several successful British magazines, presented the BBC rock music program Whistle Test, and anchored the coverage of Live Aid in ‘85. Winner of the Editor and Writer of the Year awards from the Professional Publishers Association and the Mark Boxer Award from the British Society of Magazine Editors, he is the radio columnist for the Guardian and a media correspondent for the newspaper.